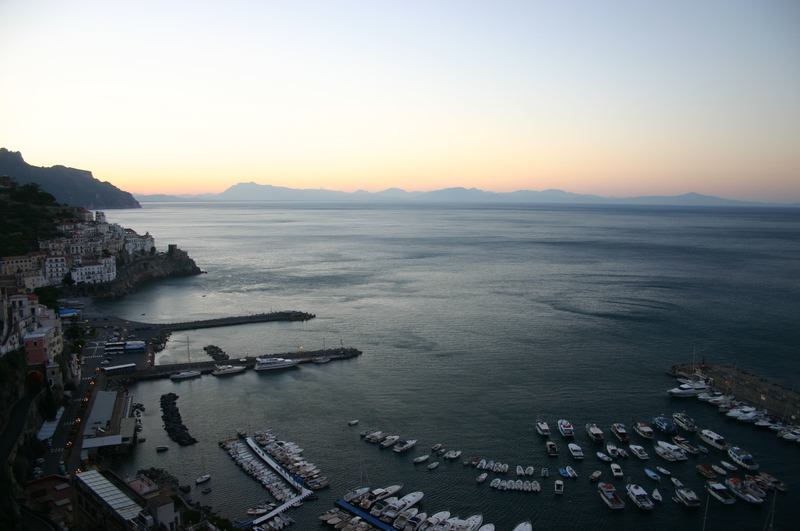 The first stop we made on this fabulous continental journey was to a little corner of Italy that juts out from her ankle, just below Naples; the area of Sorrento, to the small village of Vico Equense. Unfortunately, for my husband; from the minute we set off on our honeymoon, I cried. I think most brides are meant to feel emotional, but I, for many reasons that I will not disclose just now, was probably one of THE most emotional post matrimonial brides ever. We set of from rural Le Marche, up the dusty track from my mother’s run down yet idyllic farm and into the blazing midday sun, to head towards Sorrento. I cried pretty much all the way. I cried at the beauty of Italy. I cried when I saw the early summer sunflowers swaying in the wind, I cried because my nearest and dearest were all on their way back to Australia, England, and several other destinations. Basically, I cried. 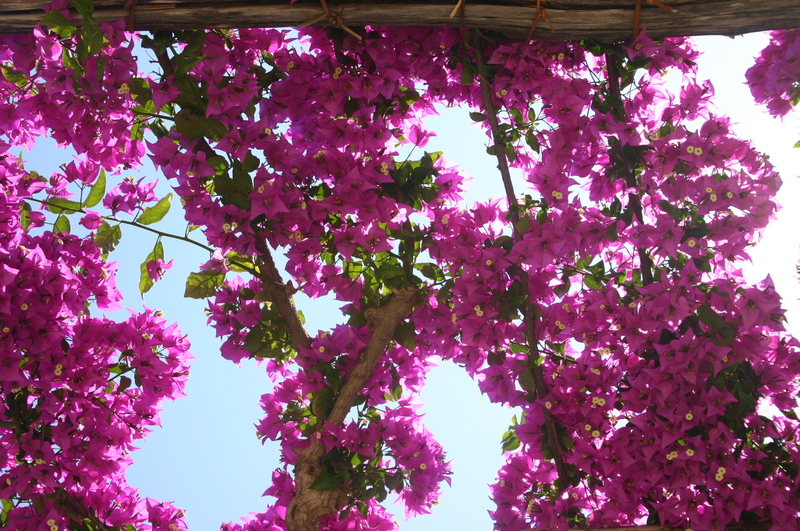 Through a blur of tears, piercing blue skies and wonderfully bright pink bougainvillea, I hardly even suspected what was in store. As we drove (with an extremely wide berth) past Naples, we headed into what would become our home for the following five days. The roads grew ever more narrow, the flowers more bright, the terracotta brick more red, and the corners sharper than had I ever experienced – even growing up in Devon, England. This region of Italy is wonderfully rich in colour. Compared to the grey brick, hazy London skies, or even the deep green of the countryside… the pops of yellow, bright pink and azure of the sea is like a symphony for the eyes. Our first stop was Hotel Capo Le Gala. A boutique, five star, and typically Italian resort. When I say typically Italian – it’s not overly elaborate, no gushing doorman; or pushy busboy, waiting for a tip. The dusty guest cars are all squashed into a tiny car park overlooking the hotel, and the ocean beneath it. When I saw from the uppermost terrace, the evening sun coming down over the horizon, I cried a bit more. We were given a room on the second floor, at the very left tip of the building. The best room in the house. We arrive just in time to drink a glass of champagne and watch the sun set. I’ve been lucky enough to see many a sunset, in several countries. In my mind it was THE BEST. Even if we did have to pay extra for the ice bucket to be sent up. No amount of fussing and fluffing in ANY resort could have topped this. I felt drunk and in love. And so we settled into our nautical, immaculately designed and exceptional corner bedroom. 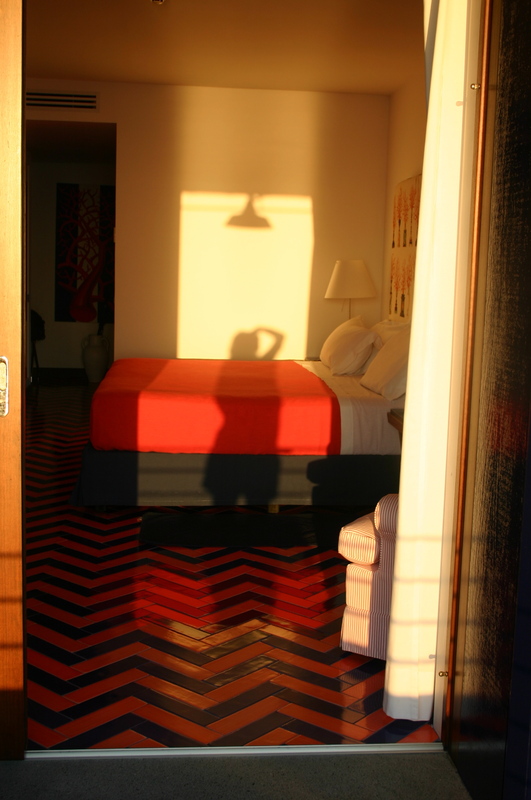 A king bed with cool crisp white sheets, brightly coloured floor tiles throughout, and views from every side of the room, including the bath. The only background music, the ocean. There isn’t a better alarm clock in the world, than the warmth of the sun on your legs through gently shifting curtains and the sound of the waves licking at the rocks. There is no beach at Capo La Gala. You can swim in the sea – but you have to climb down a ladder. So anyone (ME) with a fear of deep water and what lies beneath; should not approach the CLG non- beach. You could take a dip in the pool, but for some reason they keep it at minus 5 degrees. It’s always empty – apart from my husband’s seven-second dip, each day, at 11.55am. We decided the next day to head to the neighbouring beach resort for a (10EURO) swim. To take a break from the astounding food and luxury prices at CLG. It was surprisingly lovely. Having spent years in Australia. The European beach experience is an acquired taste. Sun beds squashed in like sardines, paying to swim!? The whole thing however turned out to be just fantastic. I loved the clear, blue Mediterranean, despite the lack of personal space, it was altogether, unforgettable. And with our daily injection of an Italian lunch of Prosecco, carbs and fat… we were in heaven. On the back of a local recommendation, we headed into Sorrento on our second evening, into Da Emilia at the Via Marina Grande. This place is a true gem. A no frills affair, right on the water. Be prepared to share your dinner with a variety of bug life, but – the best Spaghetti Vongole you will ever taste. I felt very sad to move on from Capo La Gala after three nights. It was a a place of true understated class. With evening restaurant food clearly worthy of a few awards, and one of the best rooms with a view I’ve ever experienced, I felt strangely attached to the place, despite it’s lack of beach, in room iron, or ability to produce a good boiled egg in the morning! But we had to plod on with our journey further into the Amalfi Coast. 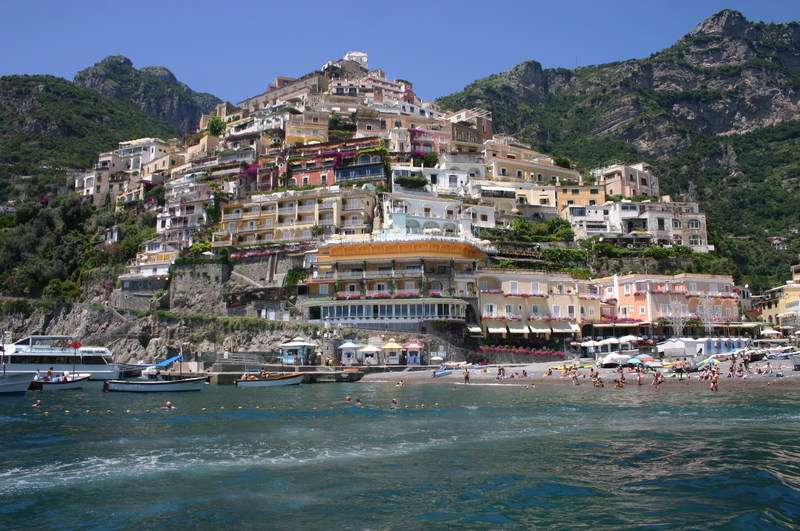 Even the word Amalfi has the most luxurious and continental ring to it. I felt so wonderfully European and adventerous as we precariously wound our way down the bustling harbour town, stopping off at many a lay by, along with other tourists, to take in the soaring views. Our next home for two nights, Grand Conventi Di Amalfi; a 12th century converted monastery, set into the rocks 80 metres above sea level. A very different experience from Capo La Gala – very grand, upon arrival. The doorman takes our keys and ferries us in a glass lift, up to the reception. The hotel still holds a lot of the orginal architecture, with cool dark stone floors, and soaring white arched ceilings. The interior design reeks of granduer, afternoon tea and expensive evening cocktails. 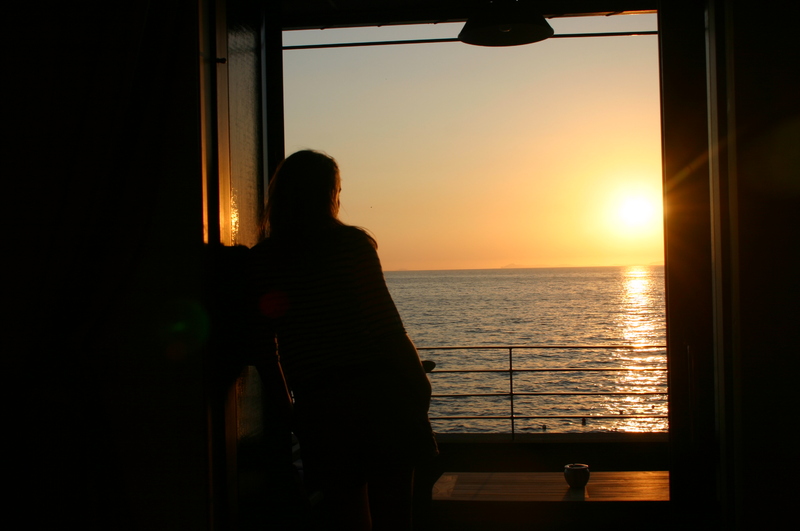 After settling into a truly wonderful room, and, as became our norm in Italy, we enjoyed aperitivi whilst watching the sun go down over the Italian sea. We decided that to sleep AND eat at Conventi may just blow our budget. Having indulged in bite size portions of fish and steak for the previous few days at the secluded CLG, decide take a wander down into Amalfi and grab some local fare. Again, heeding local advice, we head through the town wall, and along a small hidden lane way to Pizza Donna Stella. Seated outside in their lemon grove garden, we scoff down pizza, salad, delicious local wine and eggplant parmigiana all for a mere snippet. The food was sumptuous, ambiance fanatstic, and we wandered back along the harbour and settled into our five star luxury for the night. For the final leg of our Amalfi visit. We did what we considered to be one of the best luxuries ever. Spending time with dear friends who we weren’t going to see again for a very long time. We chartered a boat. And hopped around the coast, stopping for swims on the way, to Positano. Probably one of the most iconic Italian harbours ever. It clings to the side of the hill for dear life, jutting out from the rocks, frozen in time for all to see.